We are in the blessed month of Rabi ul Awwal, the month in which our beloved leader, Muhammad Mustapha (peace be upon him) was born. As such, as true believers we are happy when occasions such as the Milad un Nabi approaches because it allows us to recall something of the beautiful personality of Prophet . We can see that this verse deals with some of the favours of the coming of Prophet . Firstly, Prophet Muhammad came to tell the people about Allah . He also told the believers of the Greatness of Allah . He taught them how to purify themselves, outwardly and inwardly. Which other Messenger taught the people self purification? Some unbelievers began saying ‘what kind of Messenger is this, he is even teaching us how to use the toilet’. 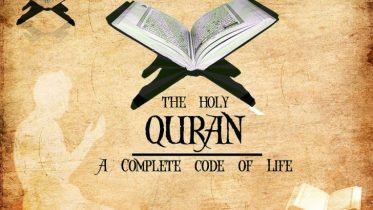 The Prophet taught the believers how to read and understand the Book. Where in the Gospel can you find Jesus (as) receiving the message and teaching it to his followers? Which other Messenger took the time to teach their followers how to read, how to understand and how to derive benefit from the message? The Prophet taught us how to utilize the message so that we can lead a successful life. These are just some of the favours Allah mentions in the Qur’an concerning the coming of His Habeeb on earth. Prophet Muhammad is indeed a great blessing and favour for mankind. Yusalluna – is a verb in present / future tense. Therefore the blessings being sent are sent constantly and continuously. Why is Allah doing this? Does the Prophet need all these blessings? Also, according to the scholars because Allah commands the believers to send blessings on the Prophet, one must do it at least once in his/her lifetime in order to fulfill the command. This command given in the ayat (verse) above is different from that of salaat (pray) because salaat is associated with time. Two things can be derived from the ayat mentioned above. Firstly, Allah and His Angels are sending blessings on the Prophet Muhammad . Secondly, Allah wants the believers to benefit from the blessings being sent and the way of doing so is to send salaat on the Prophet, and this is basically ‘Allahumma Sally Alaa Muhammad’. ‘Salaat’ here does not imply worship. By sending salaat on him you are benefiting from the blessings coming from Allah . Anas (ra) narrates that Sayyiduna Rasoolullah said: ‘He who reads a single Durood upon me, Almighty Allah blesses him ten times, ten of his sins are forgiven, and he is increased ten times in stages’. Why did Allah order us to send darood and salaam on Prophet? Some may argue that he is not physically alive so what good can come from it. Abu Huraira (ra) narrates that Prophet said: ‘If anyone of you greets me, Allah returns my soul to my body and I respond to the greeting’. So if I should say‘Ya Nabi salaam alaika’ through the Grace of Allah, the Prophet’s soul is reunited with his body in order for him to reply ‘Wa Alaika’. And this happens all the time, whenever we send salaat and salaam on him. So if I should send salaam on him and he responds every single time, then am I not building a connection and relationship with him? Sending salaat and salaam on the Prophet is amongst the Sunnah of Allah, because He and His angels are practicing it all the time. Sunnah is what you say, do and allow, so therefore salaat and salaam on the Prophet is one of the Sunnah of Allah. Some say that Allah’s sunnah is the manifestation of His Divine Attributes, but if He is doing something constantly then it is part of His Sunnah. So if Allah is doing it and you follow Him you are then aligning yourself with your Lord in a special way. Darood is indeed a great gift and favour from our Lord. Imagine that we are engaging in something that Allah is also doing at the same time. He has made His Habeeb the ‘distribution center’ of this special blessing. Ubai bin Ka’ab (ra) narrates; ‘I said, O Messenger of Allah, I supplicate often, so how much of my supplication should I devote to you? He replied, as you desire. I said, a quarter of it? He said as you desire, but if you were to increase upon this, it would be better for you. I said, half of it? He said, as you desire, but if you were to increase upon this, it would be better for you. I said, two-thirds of it? He said again, as you desire, but if you were to increase upon this, it would be better for you. Finally I said, and if I dedicate my supplication in its entirety to you? He said, then your needs will be satisfied, and your sins forgiven’. We can see that one can benefit tremendously from sending salaat and salaam on our beloved leader. We will benefit not only in this world but also the next because on that Day instead of looking for help, the Messenger ﷺ will be searching for you as he will be doing for all his followers. The matter is in your hands. O Allah, convey blessings and peace always and forever upon Your Beloved, the best out of all of Creation. Be the first to comment on "Benefits of Darood o Salaam"